Where can I buy Boat Safety Signs? What is the life expectancy for your labels? Where can I find ventilation labels? Are the signs suitable for narrow-boats? We'd like an assorted pack but need more 'Battery Master' labels? Do you still do your BSS1 sign sets? Do you have SLING labels for craning boats? Boat Safety Signs are sold by chandlers, marinas and boat shops around the country. You can also get them direct from us; especially useful if a boat inspection is imminent and a vital label is missing – see the contact page. The specifications for the materials used by Boat Safety Signs suggest a minimum life of about seven years when exposed to weather. Experience shows this to be a safe estimate as our early signs are still secure and clearly legible after more than ten years on boat exteriors. Used inside cabins or sheltered places like cockpits their life can be expected to be far longer. Also since our first production runs the durability of the materials has been constantly improved. These are included on the two LPG sign sheets: 'LPG Fuels' and 'LPG Appliances'. Yes, unless you enjoy polishing brass. One customer reported difficulty glueing expensive brass labels to his NB paintwork and didn't wish to drill holes in his boat. He was delighted to find that Boat Safety Signs offered a quick and cheap one-stop labelling solution. This only left the problem of what to do with the costly brass labels! Any themed sheet, for example 'Solo Battery' or 'Twin Batteries' both of which contain master switch labels, can be ordered in multiples – please see our ordering details. 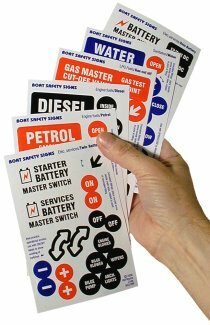 If large numbers of 'Battery Master' labels are used, say for hire fleets, for boat building or in maintenance workshops, then our re-introduced Workshop Range of label strips may be more suitable. Not really – the new smaller label sheets were introduced to replace the original BSS1 twenty-three label set. But we still have a few BSS1 sheets and salvage sheets from which we can get some individual labels. Our new signs match the earlier BSS1 labels, so if you're replacing or adding to earlier Boat Safety Signs you will continue to have matching labels on your boat. We currently have strips of SLING labels from earlier stock. Their size tends to suit larger craft. For smaller boats one can use the concealed fittings arrows, centered in the appropriate locations. We have also used these effectively on car door roof rebates to indicate correct positioning of demountable roof bars used for our folding boat.